Supporters like You Help Children like Feiruza Grow and Thrive! Feiruza hugs Erin (OT student) on Erin’s last day of her internship. Your ongoing support, through personal donations or through our annual Colorado Gives campaign, assures that children at DFX continue to grow and thrive. Through your efforts, we can provide state-of-the-art occupational and speech/language therapy services and support to families and children who are struggling. We’d like you to meet Feiruza. Feiruza is an 11 year girl with autism. She has been working with clinicians at DFX for 4 years. Her needs are significant. When she first started at DFX, she was minimally verbal, using only a few scripted words. She was in her own world, and initially, attempts to draw her out were met with aggression towards herself and the clinicians. She has significant sensory defensiveness – she is overly responsive to simple light touch, perceiving it as dangerous, or a threat. 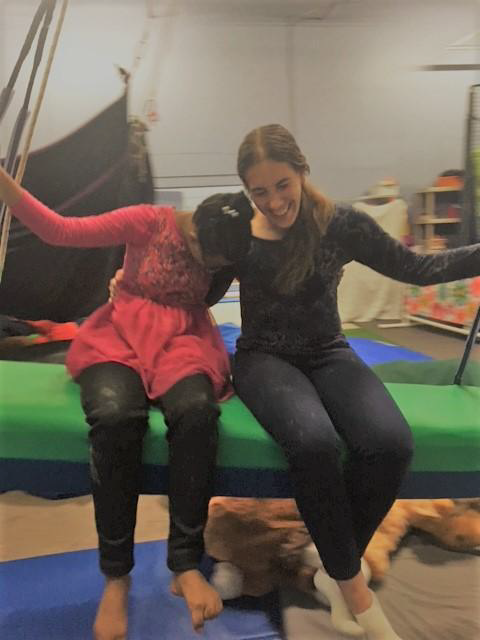 Her sensory defensiveness, among other challenges, impacts her ability to engage with others, learn new skills and just feel comfortable in her own skin. Four years may seem like a long time to be in therapy, but working with children with significant challenges like Feiruza requires patience, commitment, adaptability and compassion on the part of the clinicians working with her, as well as time. Fast forward to April, 2018. Feiruza is thriving in all environments – home, school and community. She can now use unscripted spontaneous 3-4 word sentences to communicate. The clinicians cannot even remember the last time she was aggressive, and Feiruza is embracing new experiences with a new level of confidence and skill. Feiruza’s increased relatedness has sparked more interpersonal awareness, and now, for the first time, she is addressing the clinicians by their names during play. And it is your support that allows these positive changes to take place. We’d like to thank all of you who make a difference at DFX. Please see the list at the bottom of this newsletter of all our donors who we’d like to thank.